Calvin Klein will launch CK Free Blue, a new fragrance for men, in November. 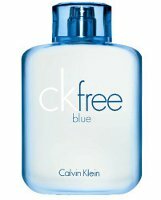 CK Free Blue is a flanker to 2009's CK Free, and is reportedly fresh, clean and masculine. ckfree blue embodies masculine freshness with its clean and airy quality – perfect for the cool, modern man. a bright, atmospheric feeling emerges from the scent, as its energetic ozone heart is balanced against a backdrop of warm, pure sensuality. The notes include lavender, mandarin, spearmint, cardamom, fresh greens, nutmeg, ozone, amber crystals, white leather and sheer musk. Calvin Klein CK Free Blue will be available in 50 and 100 ml Eau de Toilette. The most unnecessary fragrance of 2011! As if the original Ck Free wasn’t fresh enough… NEXT! I hate to say that without smelling it, but readily admit that CK Free did not seem to me to require a flanker. No, no, no! ckfree has the poorest longevity I’ve ever met. This one is lighter?? Free Blue. Sounds like a movie sequel to Free Willy. Sorry but that’s the first thing that popped into my head. I’m not into these fresh scents usually. I find them a bit dull but once in a while there’s a good one. … is it just me, or does that sound almost exactly like the original CK Free anyway? Snore. I’m digging out my old Doc Martens and Green Day tapes tonight, because apparently it’s 1996. Ozone in a perfume? What a unique idea! Hey, do you think Ross and Rachel will ever get back together? Oooooh…fresh, clean and natural…how original!…NOT!…completely pointless release.